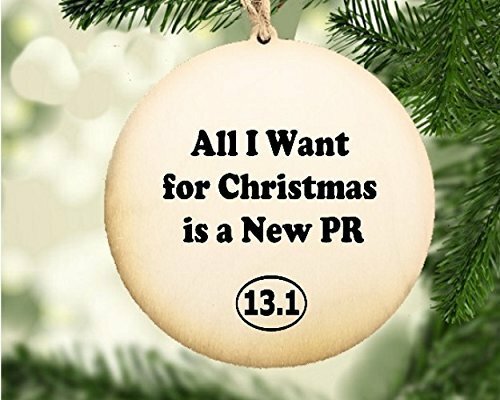 Just what a runner wants - a cool new ornament and a new PR! This ornament is also available for the 5K and marathon distance in our shop. Always a popular item at art fairs, people comment "This is so cool! How did you do that?" Folks are fascinated with the final product (and we think it's pretty awesome, too, if we do say so ourselves!). What makes our wood ornaments special is that the image is right on the wood - it's not paper glued down, it's not cut-and-paste, it's not decoupage, paint or vinyl. Only the print is on the wood - the wood grain shows through in areas and the effect is really cool! Each ornament takes about 3 days for us to create (wish we could make things dry faster!). Everything is sanded smooth and sealed for durability. Each ornament is approximately 4" and includes a cord for hanging. If you have any questions about this product by Peppercorn Princess, contact us by completing and submitting the form below. If you are looking for a specif part number, please include it with your message.